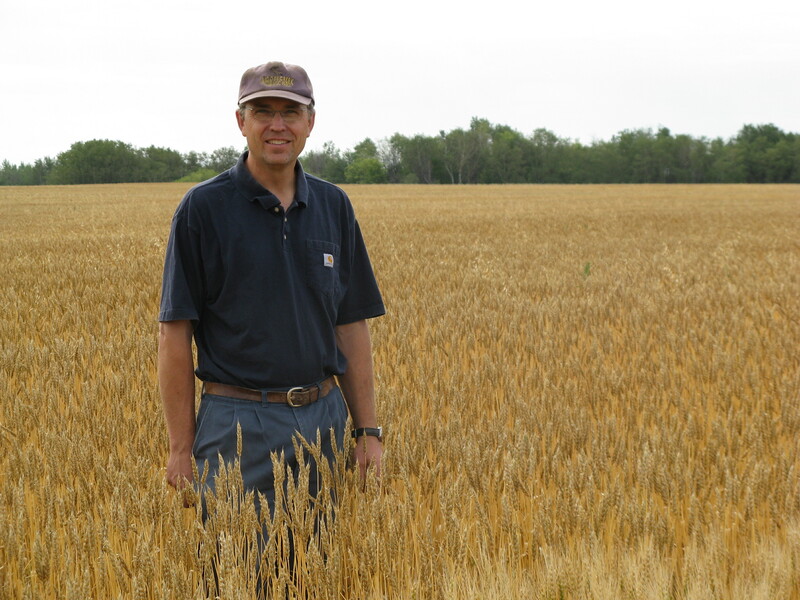 Effective weed management strategies for diversified organic grain production. Managing weeds in our fields is always ongoing, since it’s an essential part of producing high quality crops. One of our key strategies is to avoid having fallow acres without anything growing. In acres without alfalfa or clover growing for plow down (usually about 30-35% of our total cultivated acreage), we plant and plow down an annual pea, lentil, or faba beans. The rest of our acreage is planted either to alfalfa or an annual crop. Whenever we’ve been able to leave alfalfa in for a long term, weed pressure is reduced significantly for crops that follow. Allowing for long-term alfalfa in rotations is also important for fertility management, since alfalfa increases soil phosphorus availability. Alfalfa on most farms is used for hay—in that situation, alfalfa might be in fields for 3 to 7 years before being taken out of production. On our farm we tend to leave alfalfa in for at least 1 to 3 years. If we can leave it to grow longer, up to 5 years, the better the following crop will be. Partly this is because of the weed control you get, but also because alfalfa fixes a lot of nitrogen. Alfalfa’s very deep rooted—its roots go down 20 feet, and it has very good root systems that help prevent erosion. It’s a really nice crop to grow. I caution people against using alfalfa in drier regions, though, because it could leave you with a soil moisture deficit. In drier regions, it would be preferable to plant yellow blossom sweet clover, making sure it’s plowed down very early (at 10% bloom) or annual legumes such as forage peas or chickling vetch. Both alfalfa and yellow blossom sweet clover are very good at breaking out hard soils. Harrowing weeds with a tine weeder or a regular tine harrow is an option. Pre-emergent harrowing is a good option, as a lot of weeds can be removed before emergence without hurting the crop. Since wheat is fairly competitive, I don’t post-emergent harrow, as it does set back the crop. I have tried a tine weeder and rotary hoe on lentils and other crops. The rotary hoe takes a lot of passes to be effective and the tine weeder drags too much residue because lentils and peas are planted on stubble with lots of residues. Both implements have their place but can be limited in actual usage because of timing constraints. Pre-emergent harrowing before the crop is up is probably the best and safest method. Thinking long-term for soil fertility. After more than three decades as an organic producer, the most important insight I have is that rotating ruminant livestock production with crop production will produce more sustainable soil fertility and help keep weed pressure down. The presence of ruminants increases soil and plant bio-diversity, which is beneficial. Operators considering transitioning to organic grains production should consider if it’s possible to share land with a large livestock producer, to rotate intensively grazed pasture and hay land with perennial grasses and legumes, especially alfalfa. We don’t have livestock on our farm, however. While integrating livestock would solve quite a few of problems we face as organic producers in terms of weed and fertility management, at our farm’s scale—now with more than 4300 cultivated acres—it would be a real challenge to take on managing a livestock operation big enough to be meaningful for our cropping system. We let the soil organisms act as our livestock, for essentially they do the same thing as livestock for the top layer of the soil, minus the hoof action. It’s worth noting, however, that in our system we are still drawing down our P, K and S and numerous micronutrients, with exported losses in the form of grain and occasionally hay. We try not to sell hay, as it is a bigger drain of soil nutrients than grain alone. Instead, we commit to setting up long rotations, growing a lot of alfalfa and alfalfa seed, which provide us years of relatively weed-free, fertile soil for organic crop production. What we need for our farm now is to figure out our strategy for long-term fertility beyond using alfalfa. We’ve tried a pelletized chicken manure that can be spread at the same time that lentils are seeded. We are always on the lookout for products with high available P considered compliant for organic production. We have considered a product containing bone meal product called Tek-Mac (Good N’ Green) (3-15-3) but it’s not cheap, or local. A product that can be applied with the seed using an air seeder is the best option. Composted manure is another option, though figuring out how to modify a spreader to accurately spread small volumes of composted manure is a challenge. Equipment and cropping considerations for diversified production. We’ve grown a lot over time in terms of acreage and the diversity of crops we produce each year. When we started out, we were growing a lot of wheat, flax and peas; lentils we grew fairly early on, but not large acres. Starting out we didn’t have large acreage of alfalfa, like we do now. Lentils and peas require special equipment, including a land roller to level land for harvest. It’s also good to have a good swather or flex head for harvesting. As we made a little more money, and could invest in equipment, we also started looking for crops that other farms weren’t prepared to grow, always keeping in mind that we’d have to figure out how to manage weeds. When deciding which varieties to plant, it’s also really important choose qualities you are certain your customers want. Row crop cultivating of soybeans and corn is common on organic farms in the areas where these crops are widely grown. We used row cropping to grow sunflowers in the 1980s and 1990s, which worked quite well. We have been growing solid-seeded soybeans with limited success since 2014. In 2016 we purchased a row crop planter and cultivator, to try row cropping on 30-inch rows, to see if that improves yields and weed management.